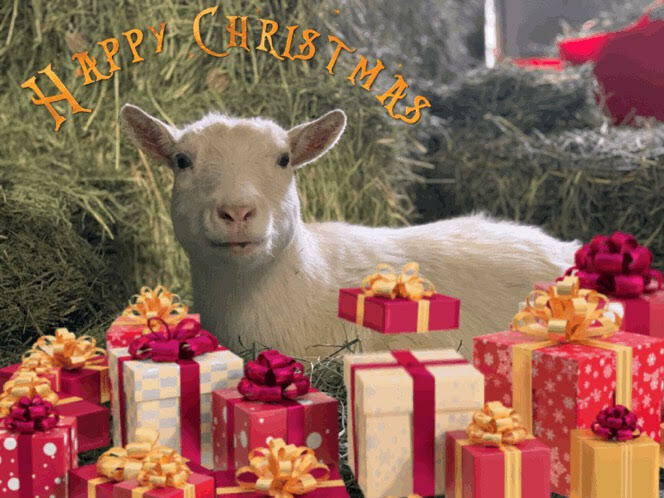 Happy Holidays to all of our friends and supporters! 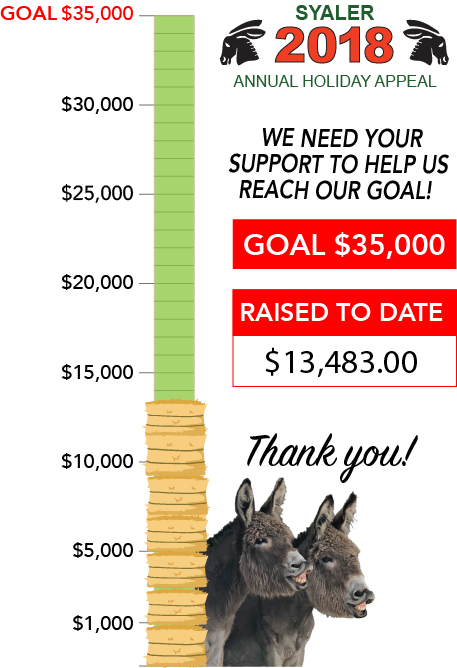 There are only a few days left for us to reach our goal-won’t you please consider a donation? At SYALER, ALL of your donated funds go directly toward the care of the donkeys, mules, and hinnies, as they wait for their forever homes. We only have one full time paid employee, the rest of the work (and it’s a lot!) is done by a dedicated team of volunteers. 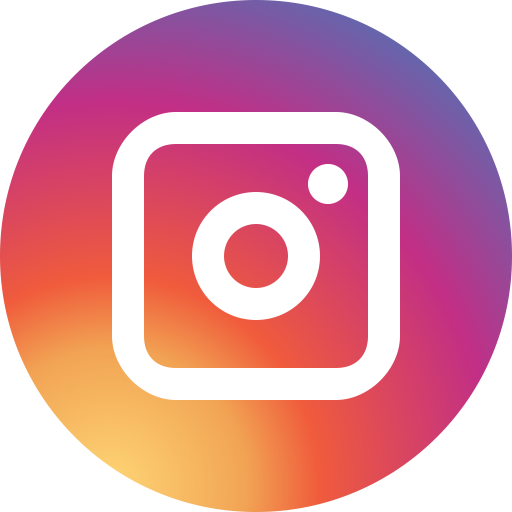 Your support is essential to continue our mission! Please consider a donation of any amount. 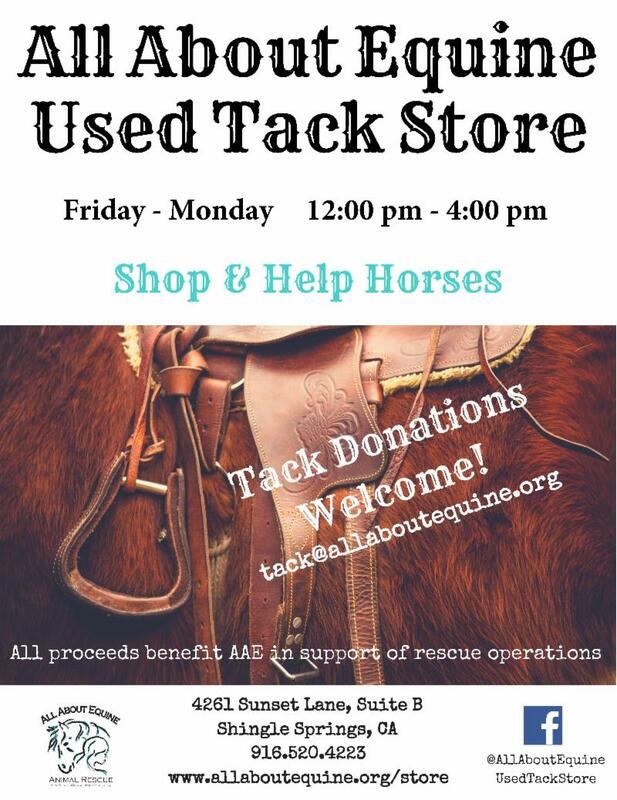 Even $5 will buy a bale of hay, $35.00 will pay for a hoof trim, and $70 will cover a farm call by one of our wonderful veterinarians. 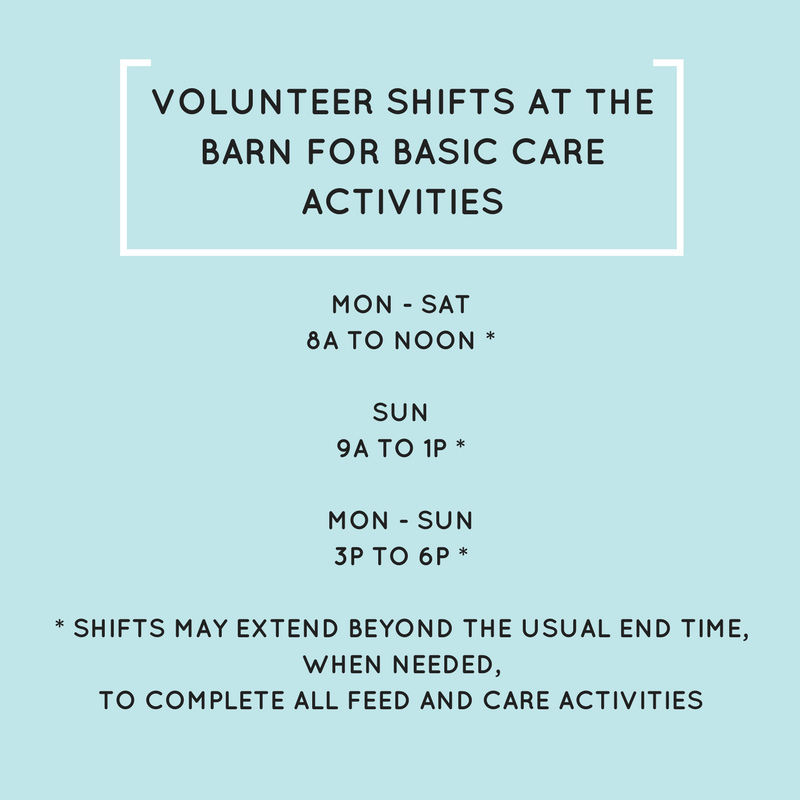 And now, with our fearless leader Ann Firestone out of commission with a broken leg, funds are also needed to hire temporary barn help until she gets back on her feet. 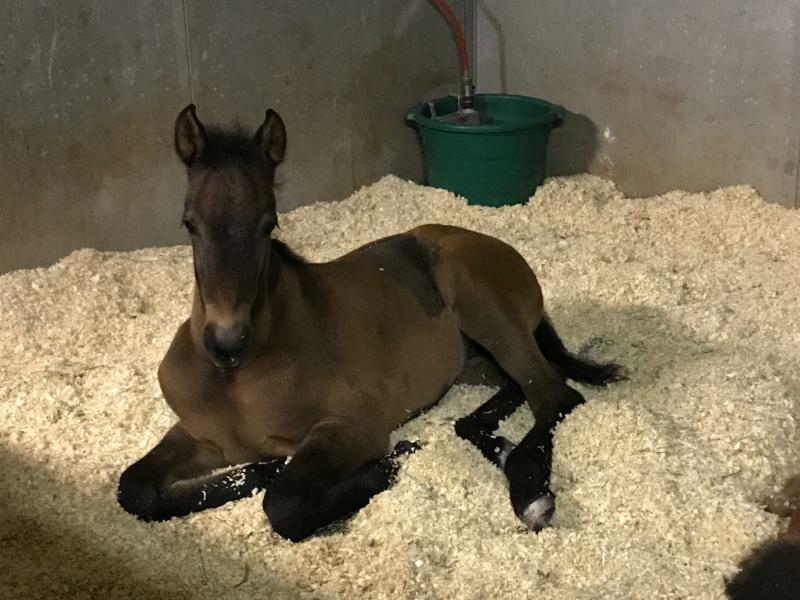 This little Rascal faced a lot of challenges from her first moments on Earth! 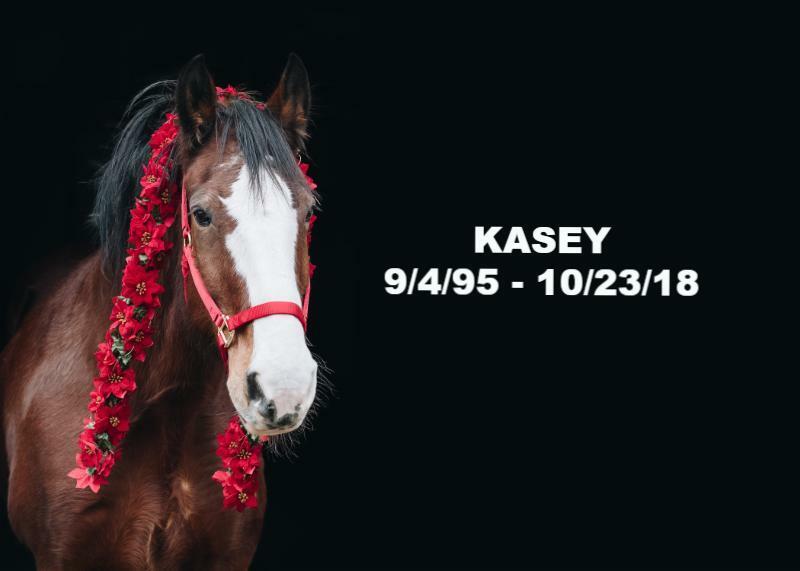 AAE’s call for help with Rascal came on April 5, 2017. 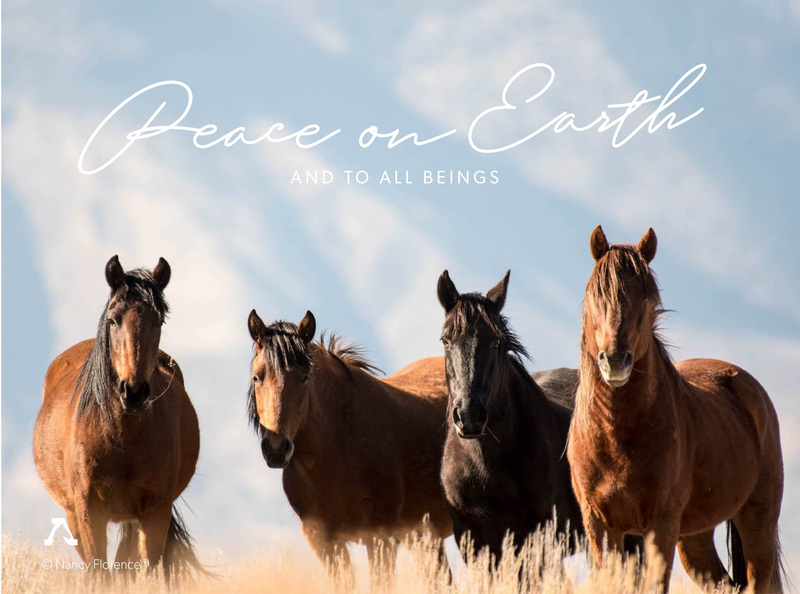 DreamCatcher Wild Horse and Burro Sanctuary was in transition after the long illness and passing of their Executive Director, Barbara Clarke, in November of 2016. 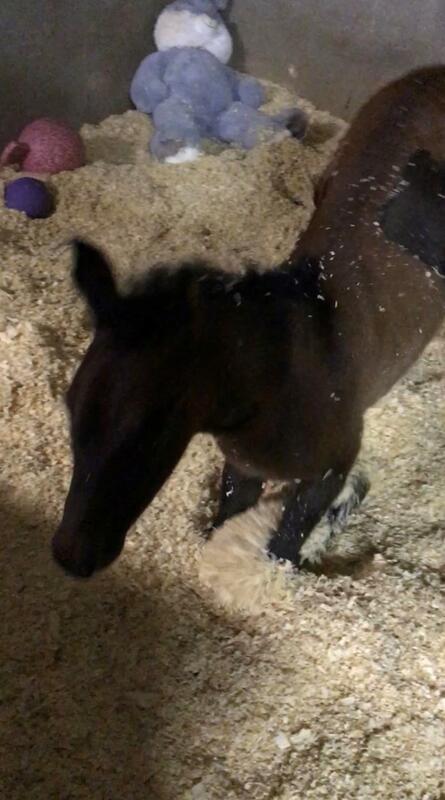 We are so happy they reached out for this little gal! She is as special as they come. 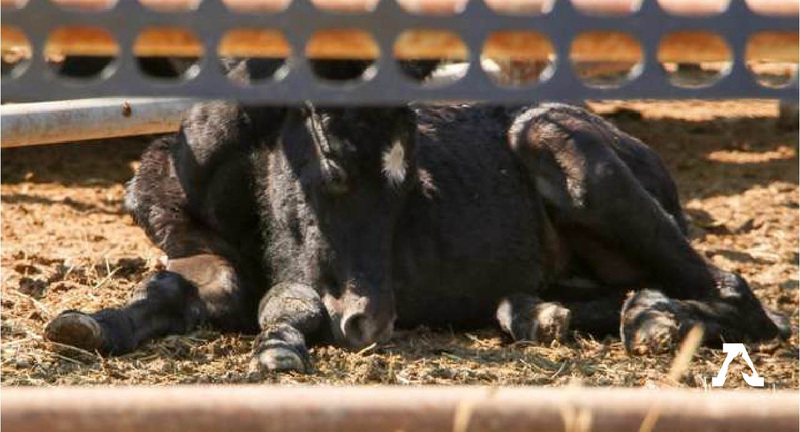 Rascal was just hours old when her mom scaled a six foot paddock and left her behind. She was located over five hours away, so we mobilized and met in the middle in Reno to pick her up. 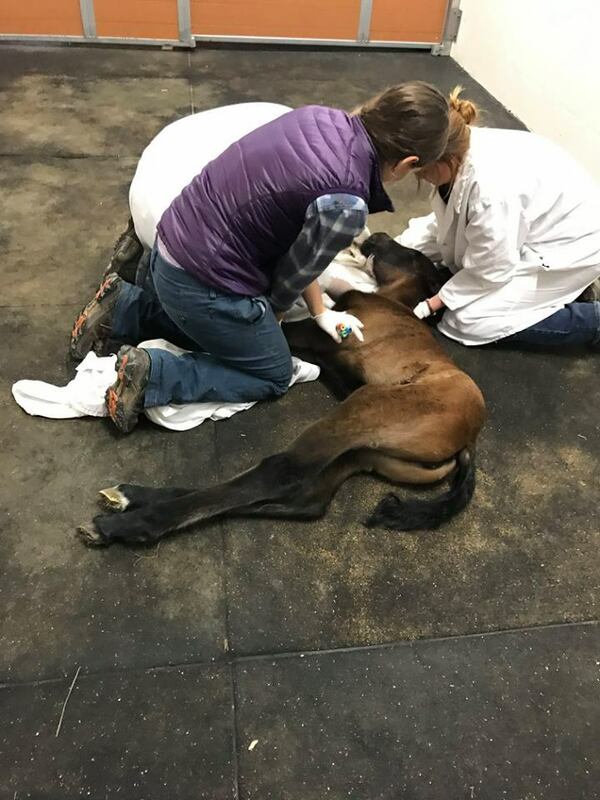 She was very weak, and couldn’t get up on her own, so our first stop was Loomis Basin Equine Medical Center. She was hospitalized. The initial outlook was good until her blood values took a dive in the night. Fortunately, by morning, she was fighting back. As it turns out, she was fighting a severe selenium deficiency that caused white muscle disease, which also put her kidneys in distress. 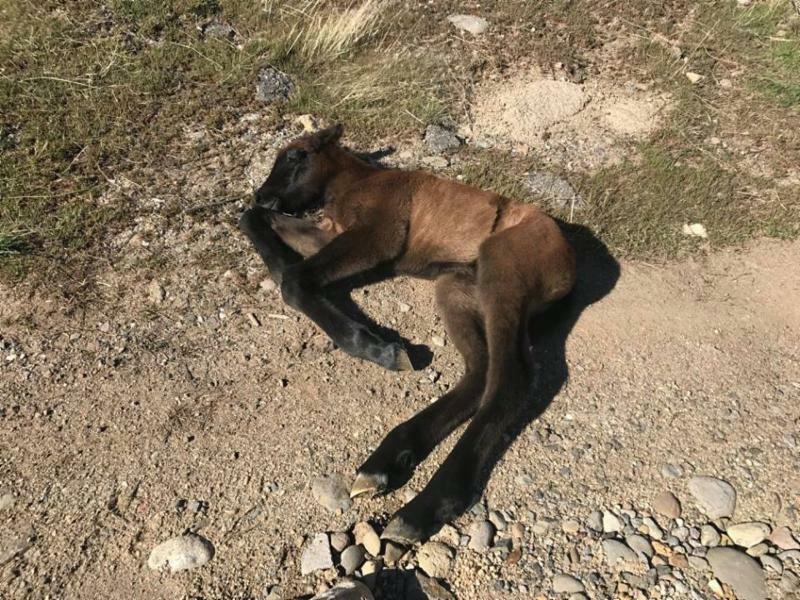 This sweet little filly could not stand up on her own for the first 26 days of her life. She’d wait patiently for a “boost”. (This pic is after 26 days, but this is how she’d wait). 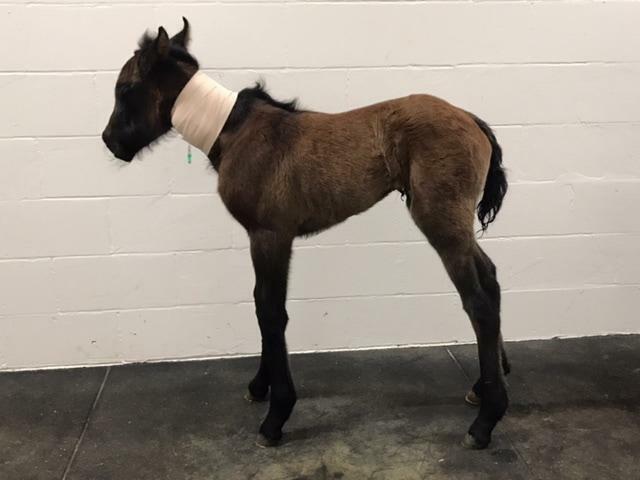 Thanks to your support, the excellent care of the staff at LBEMC for 13 days of her life and 24/7 care of dedicated volunteers at AAE for another 13 days, she Rascal was finally able to STAND on her own. 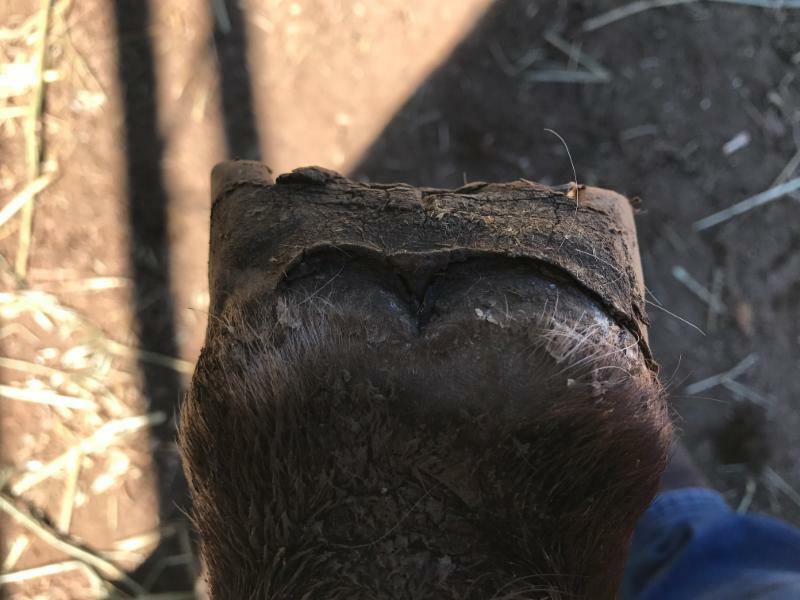 Rascal had several more hurdles along the way including two bouts with c. diff bacteria causing nasty diarrhea, a large umbilical hernia surgically repaired (after the c. diff resolved), a massive hoof abscess, and a month after hernia repair surgery, chronic diarrhea that lasted for nearly a year. A plethora of diagnostics were done to rule out the bad guys (it was not another bout of c. diff ), a variety of feed changes, a variety of supplements, a few changes in housing and locations, and various other efforts didn’t resolve the mystery or the runs. Eventually, pasture life did. 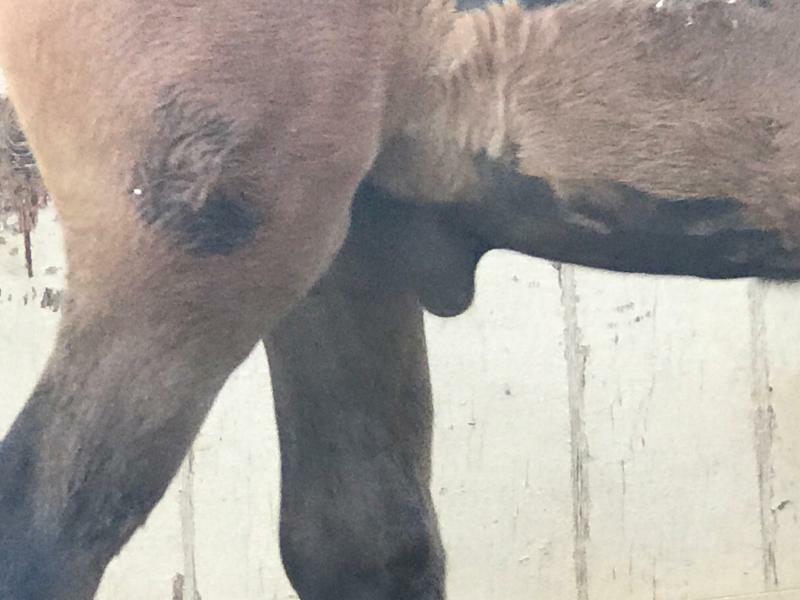 Thanks to her umbilical hernia, she was often confused for a gelding. when it finally exposed it’s ugly self. 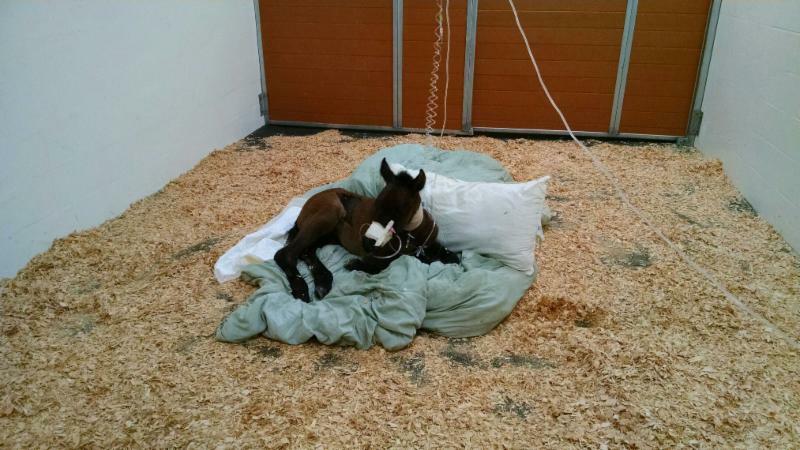 Chronic diarrhea, blood tests, abdominal ultrasound, and a variety of diagnostics couldn’t get to the “bottom” of it. Looking gorgeous as ever, and still hiding the chronic diarrhea very well. She had an adoption pending resolution of the diarrhea that never resolved. Adoption fell through, but adopter fell madly in love with another cutie pie. Rascal just wasn’t ready to leave. Today, she is healthy and thriving, and most significantly, she passes normal poop. For Rascal (and all of us), that’s reason to celebrate. That being said, due to her history of white muscle disease, there is potential her muscles were compromised, so she is not considered a prospect for hard work (e.g. endurance, performance work, competition, or anything that might be too demanding on her systems). 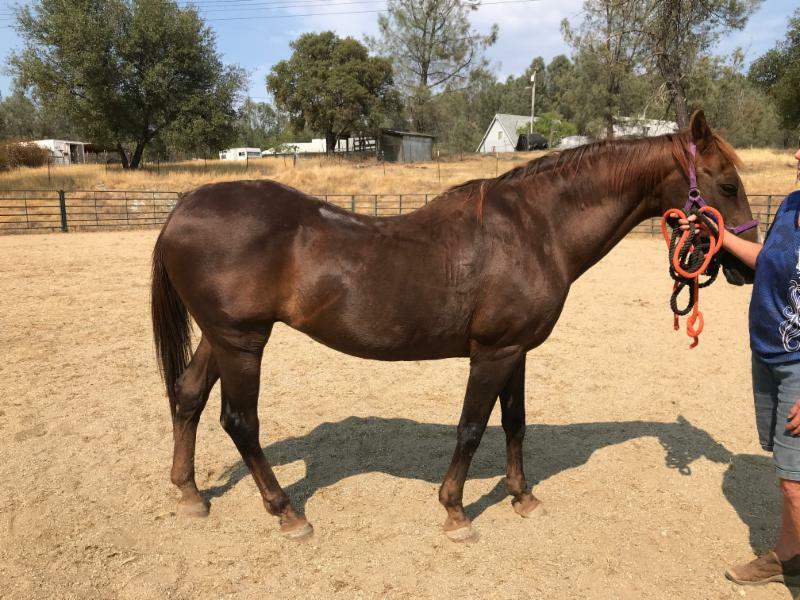 Though she is very active in the herd and she runs up and down the sloped pasture at AAE, she is looking for a home where she can learn to become a casual, easy going trail horse or some other lighter activity. 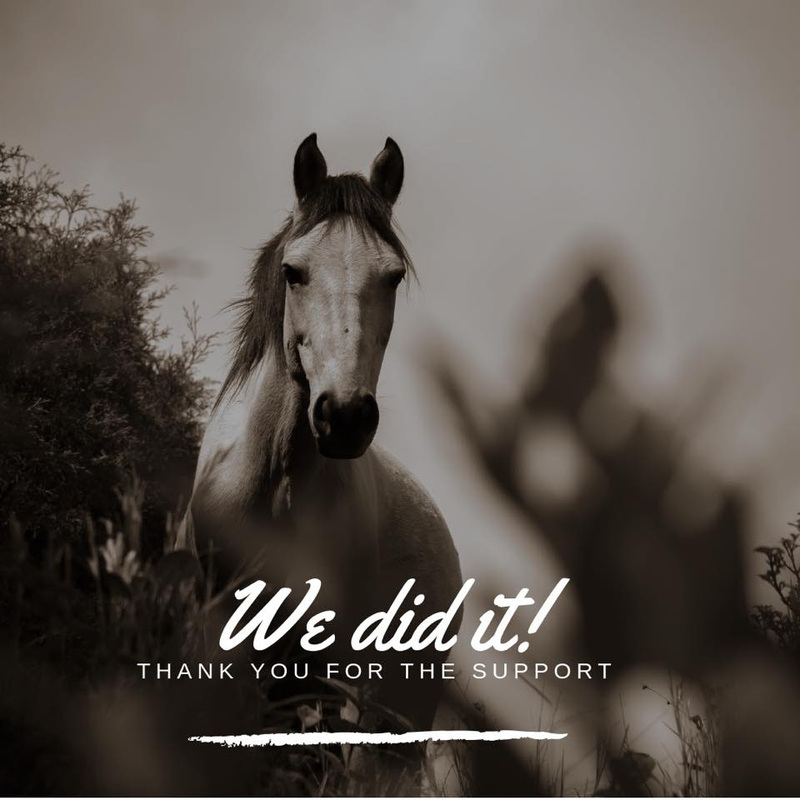 6 days until 2019, YOUR donation means more horses can be helped! Donate Today! 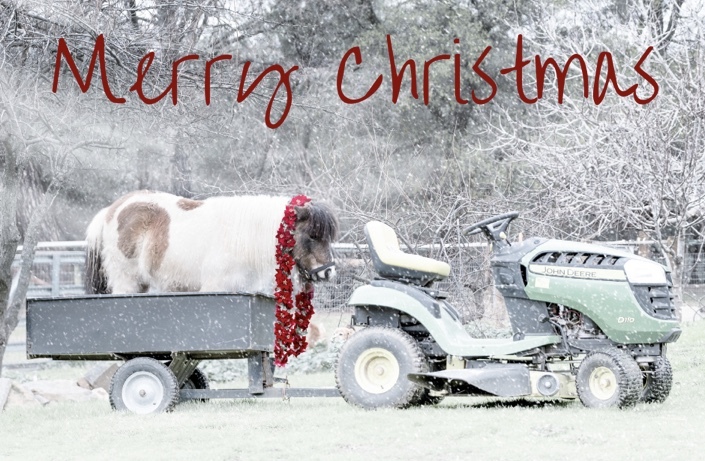 From our Barn to You, Merry Christmas and Best Wishes for the New Year! Only a few days left to get your tickets!! We have 57 tickets left! 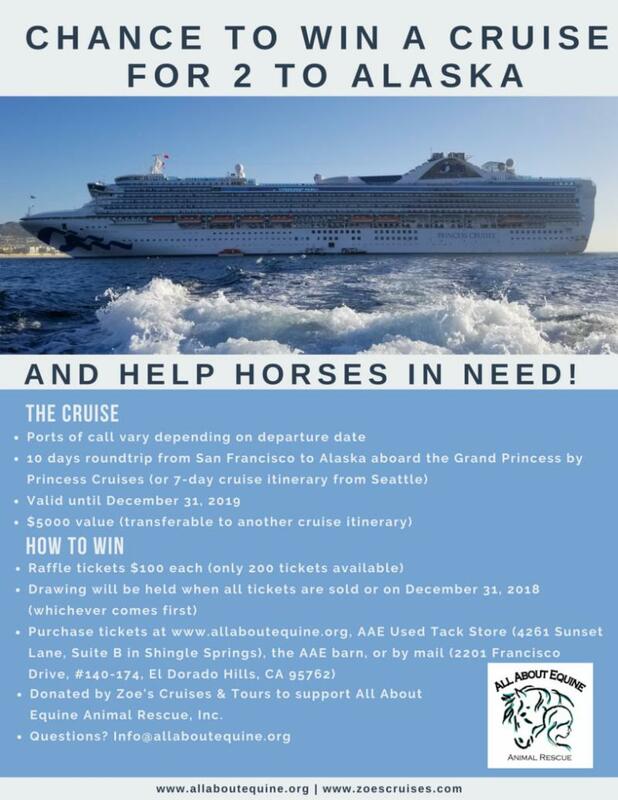 Drawing will be held 12/31/18 or when 200 tickets sold, whichever comes first. 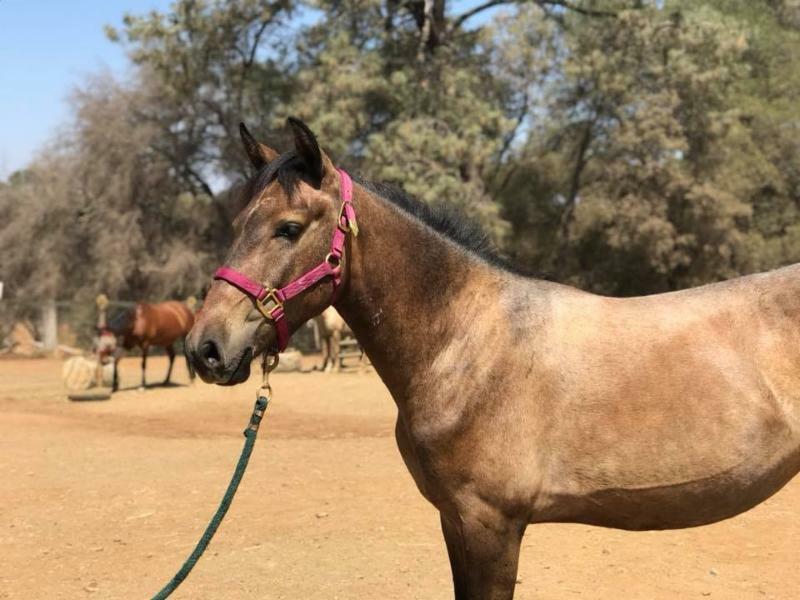 Skye is a beautiful Arabian mare that came to All About Equine from a former Arabian breeding ranch in March of 2015 after the last member of the family passed away. She is estimated to be about 16 years old (per teeth). 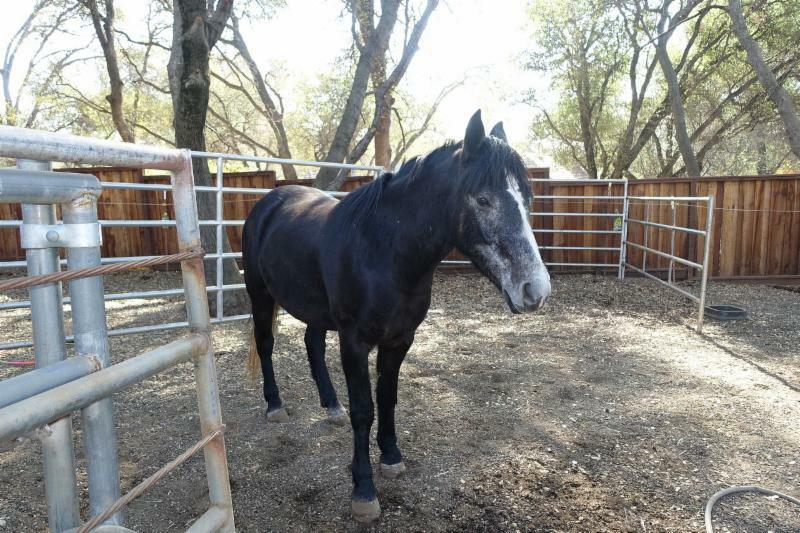 She lived her entire life in large, grassy pastures that backed up to the Cosumnes River. It didn’t seem she’d had any care for several years. 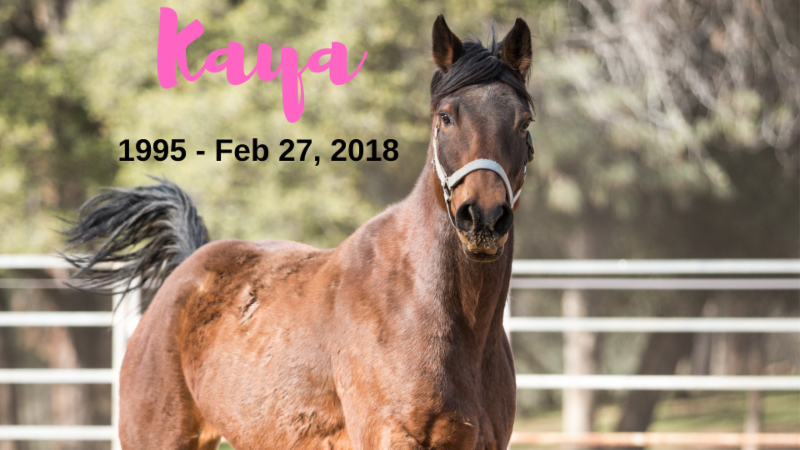 Skye was living with three other mares when we got the call. She was social, but timid. 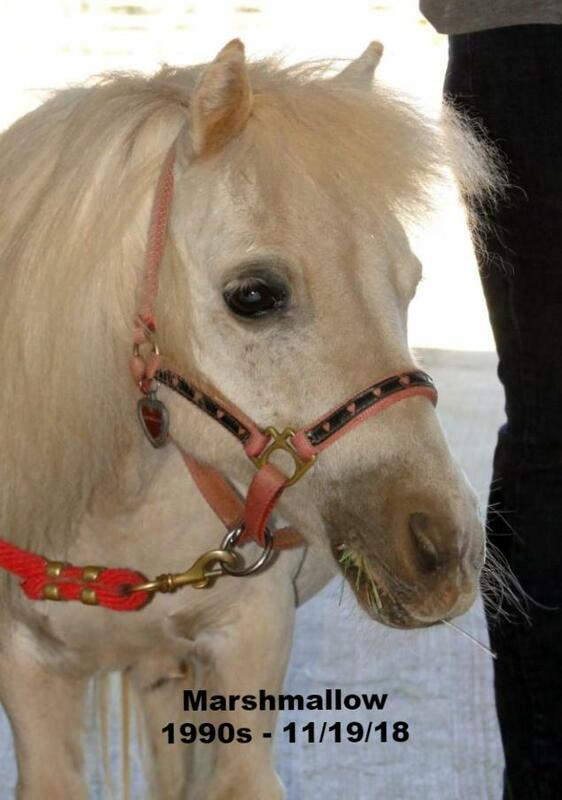 As a result of Skye’s neglect prior to coming to AAE, she experienced chronic laminitis. She was not lame when she came in, but she had very long toes. Radiographs showed she had developed a very slight tipping (ski tip) of her coffin bone. 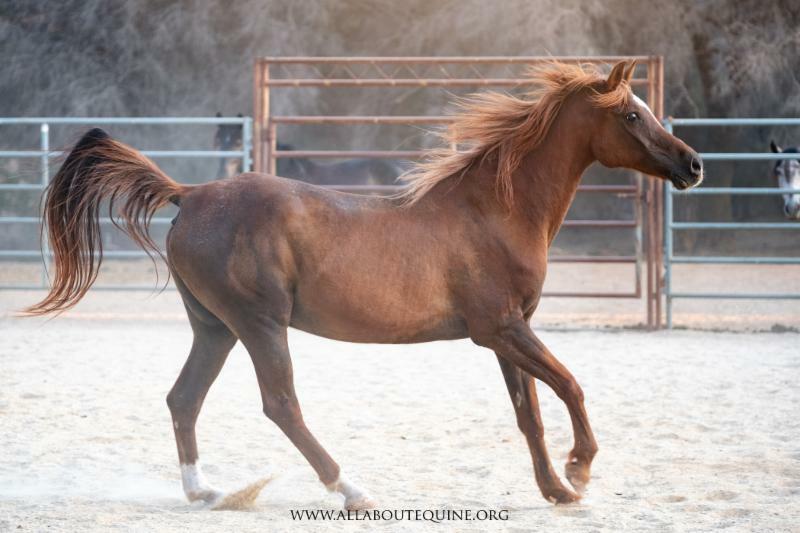 She has not shown any signs of lameness while at AAE. 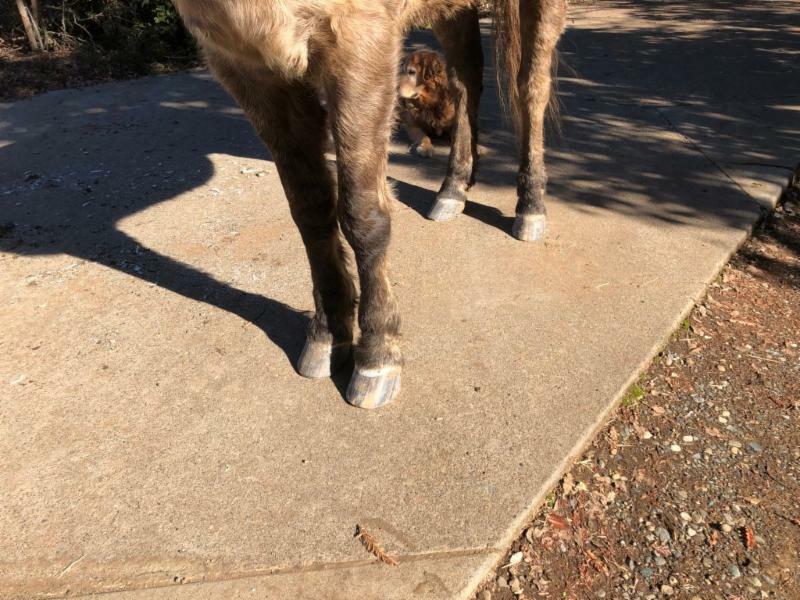 She was cleared for light/casual riding by vet, with the caveat that she might need shoes. Not long after she returned to AAE from MRILC, Skye was adopted (August 2015). 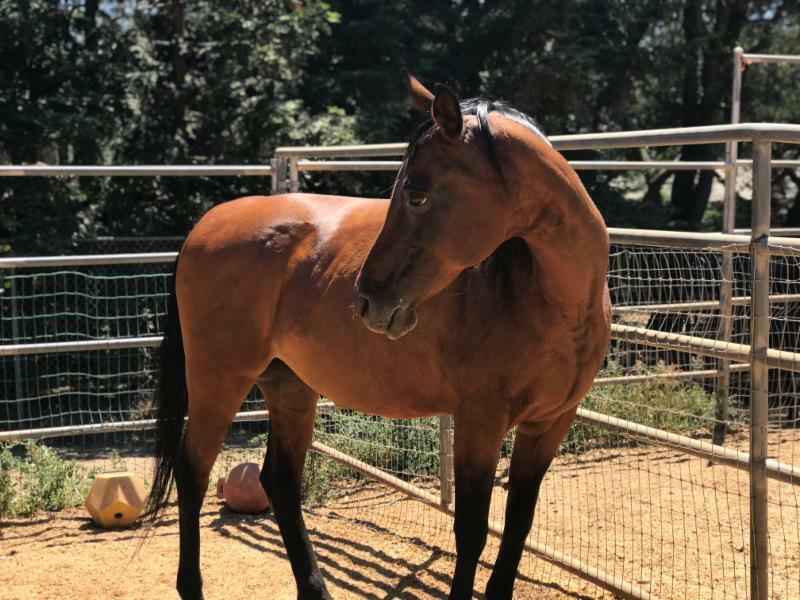 She came back to AAE earlier this year, in July 2018, after her adopter felt she wasn’t getting what she needed. Though he loved her, he felt she deserved more. 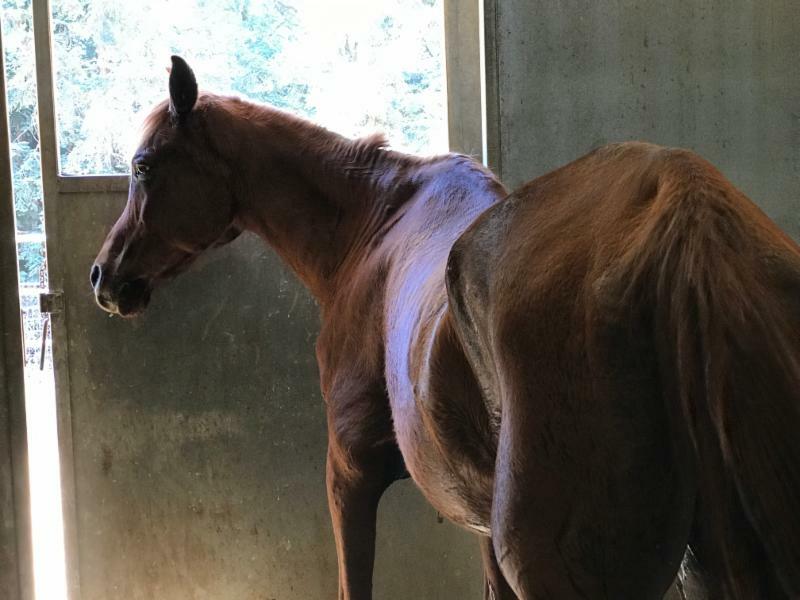 While away, Skye got a ton of groundwork, and she was ridden a handful of times in an arena. 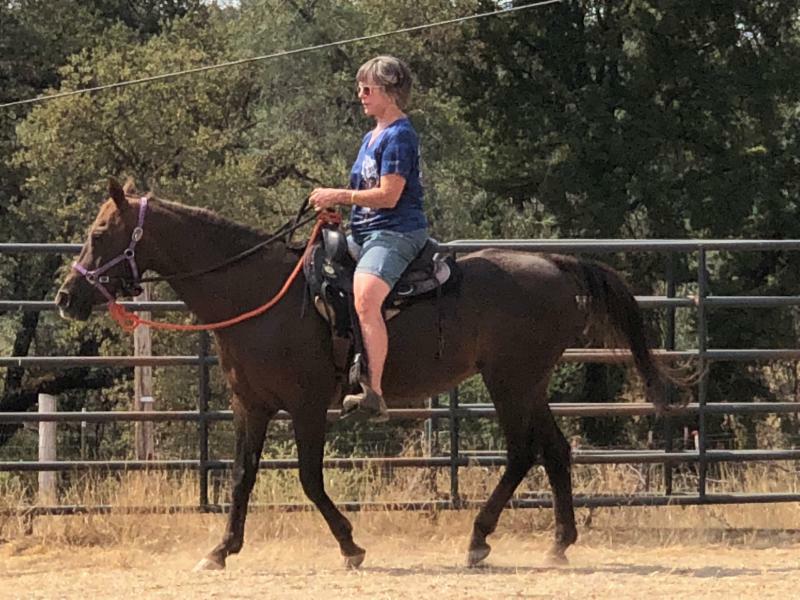 Per prior owner, she did better with an experienced, smaller rider. 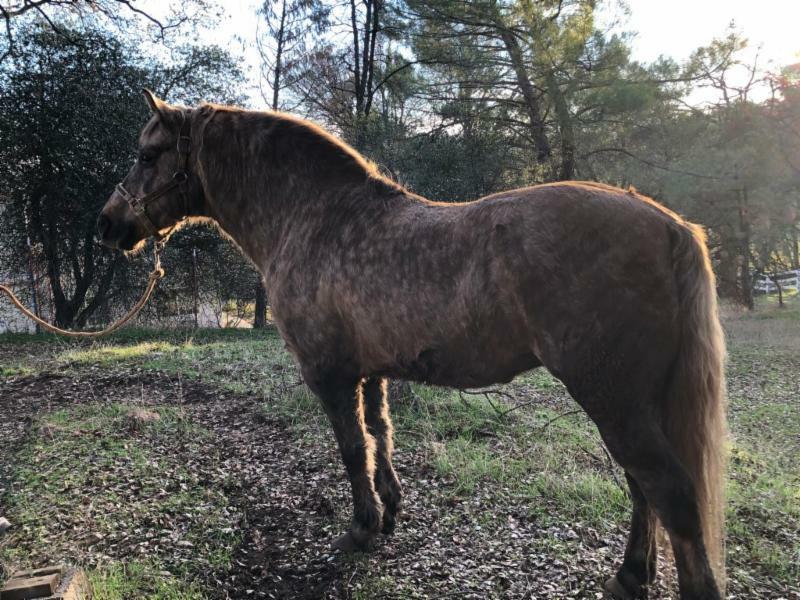 He also thought he might be too heavy for her and worried about her hooves, but he said she never showed any signs of lameness. 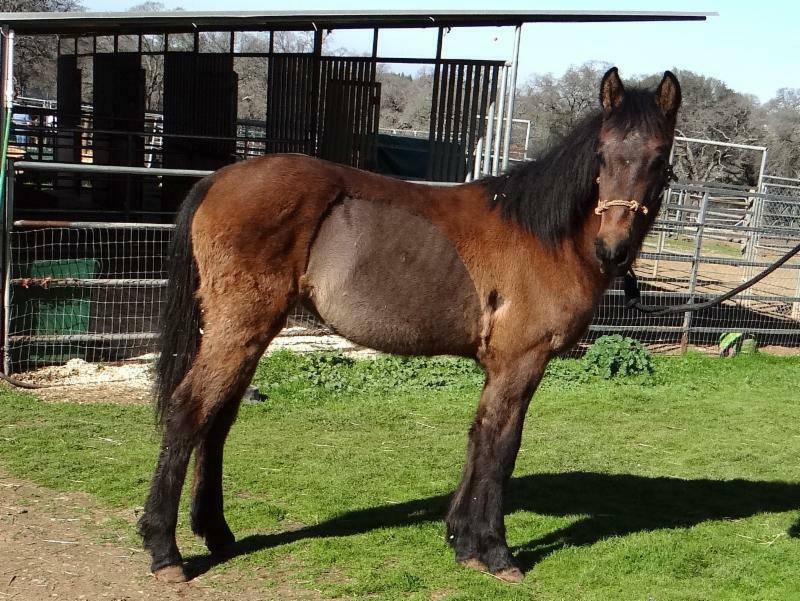 Skye has grown into a very sweet, willing, mild-mannered mare (with humans), and she loves grooming and attention. 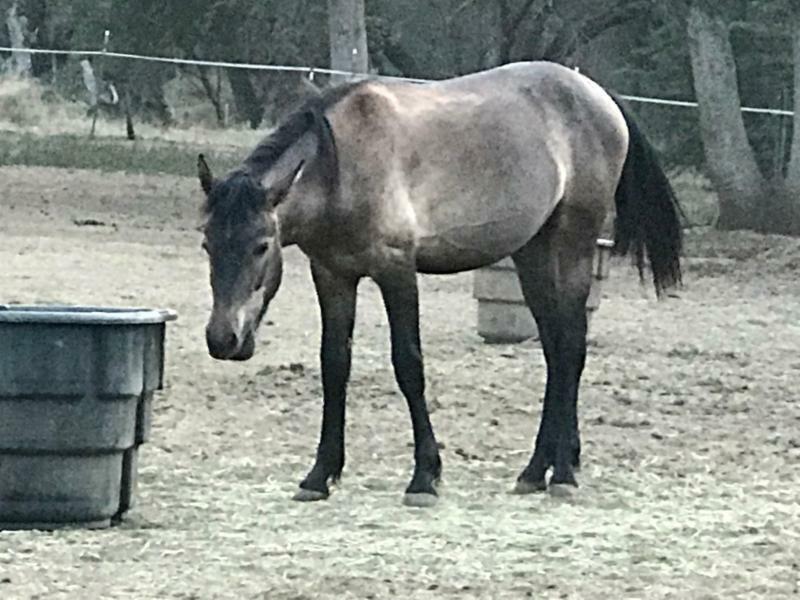 She is mare-ish in a herd environment. 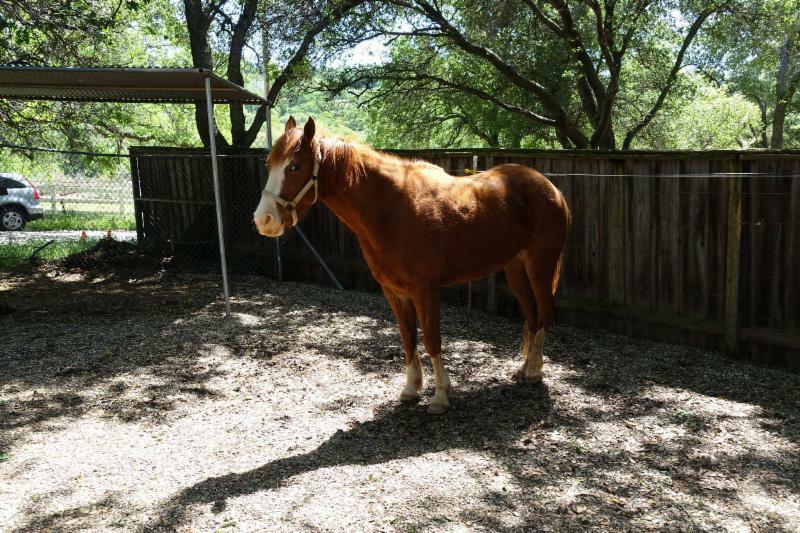 Skye is up to date with vaccinations, deworming, and hoof and dental care. She had a micro-chip in place. 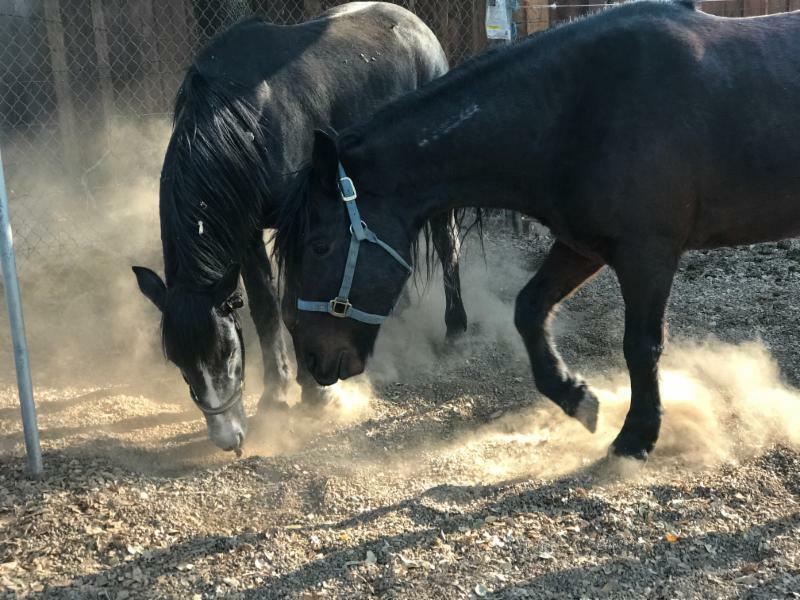 Skye recently (July 2018) tested positive for insulin resistance, and she is given a daily supplement (ThryoVet) with her feed. She is on an orchard grass only diet. 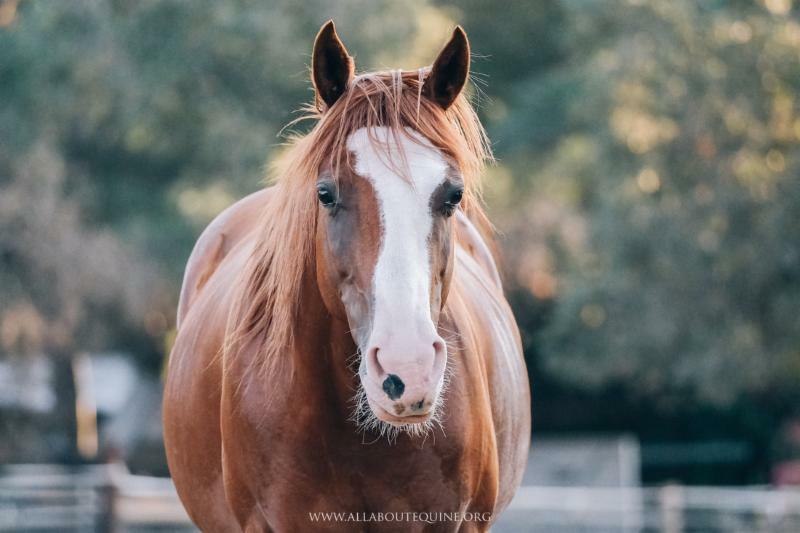 9 days until 2019, YOUR donation means more horses can be helped! Donate Today! 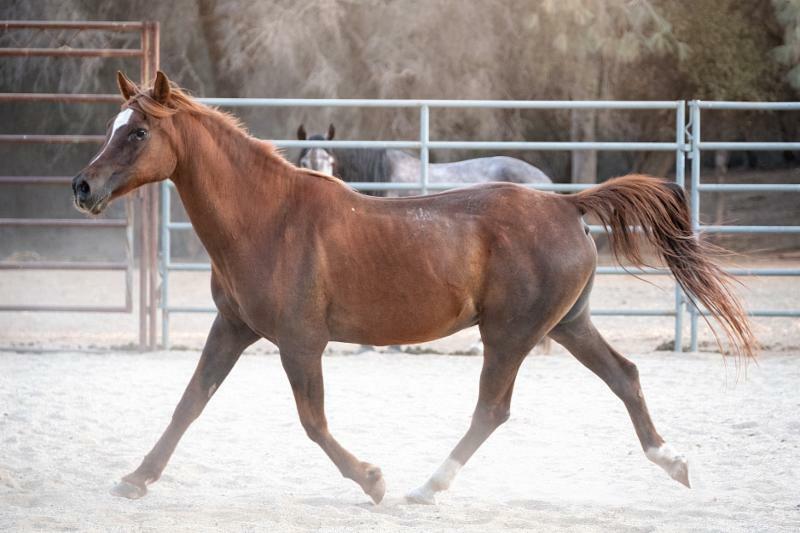 Clancey is a 25-ish year old Quarter/Arab mare that came to AAE through no fault of her own. 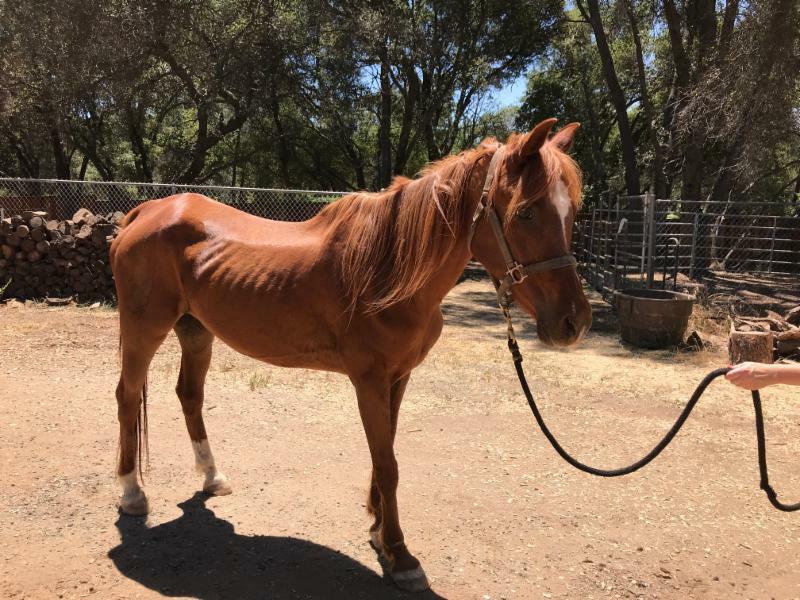 Her owner was moving and she was taken in by another family on an impulse to help, but her new family’s other horses were not accepting her. 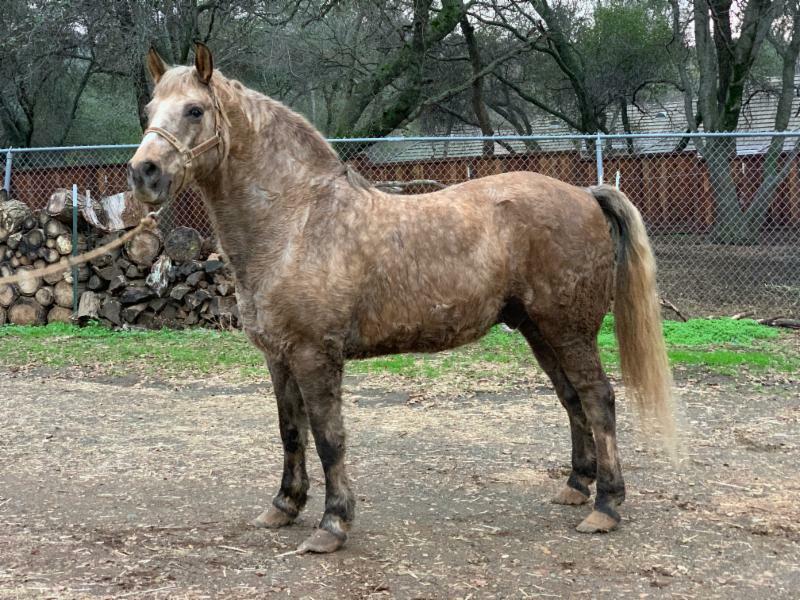 Clancey has a pretty face and really loves attention and grooming. 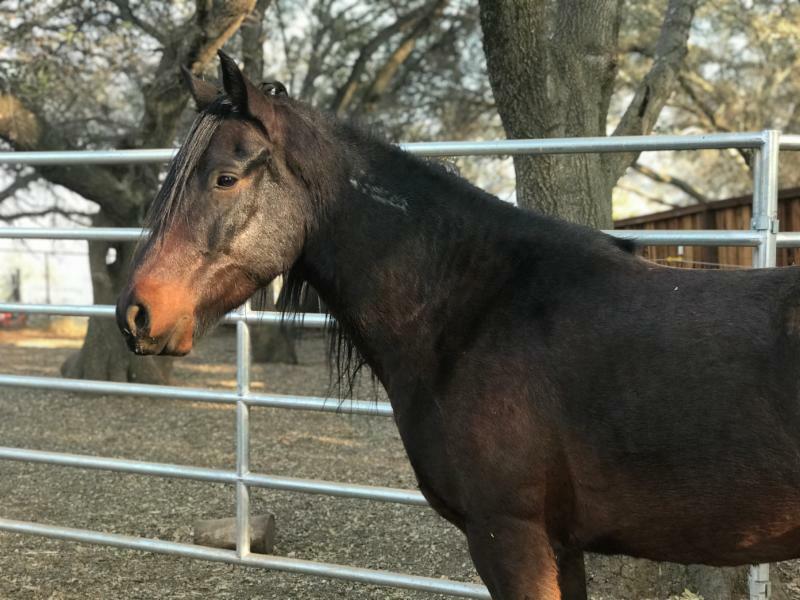 Her previous owner rode her in all types of events: trail riding, gymkhana, high school rodeo barrel racing, polebending, and parades. Clancey has very good ground manners other than being a little pushy with her head. 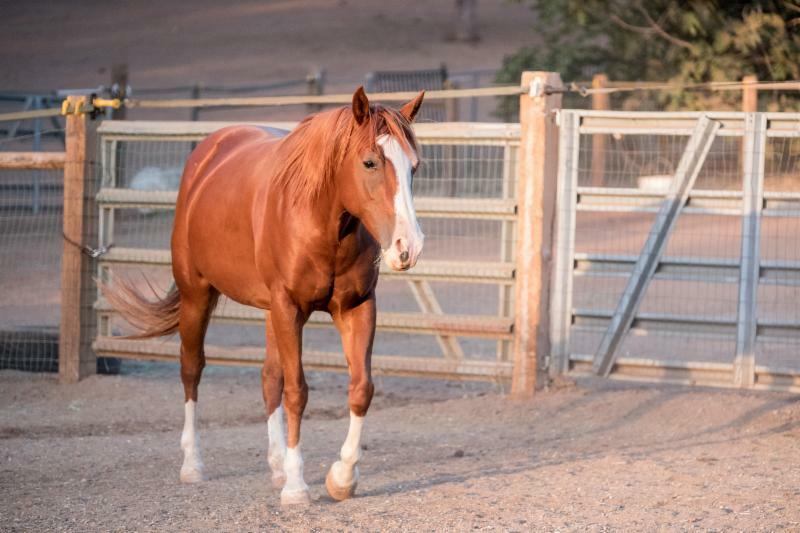 She follows along by your side, turns both directions easily, stops and backs up on command. She loads into trailer with no problem. She stands for farrier with no fuss. 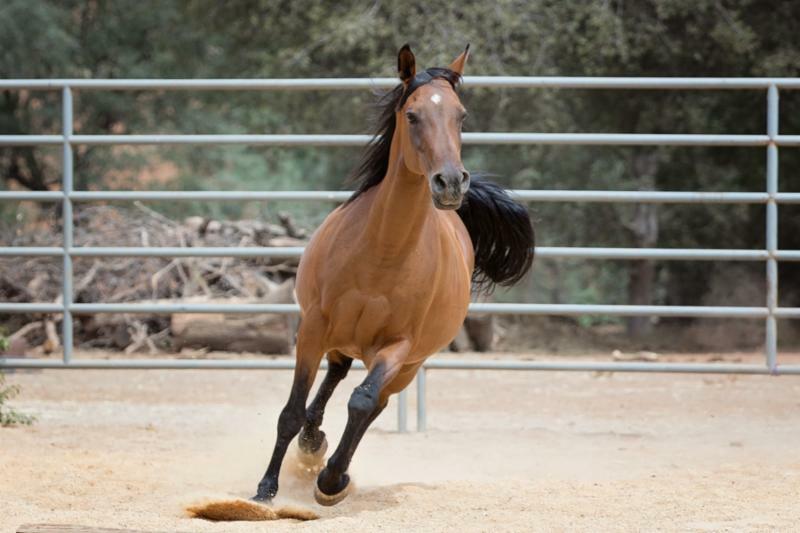 Pictured here riding in a halter with a lead rope. 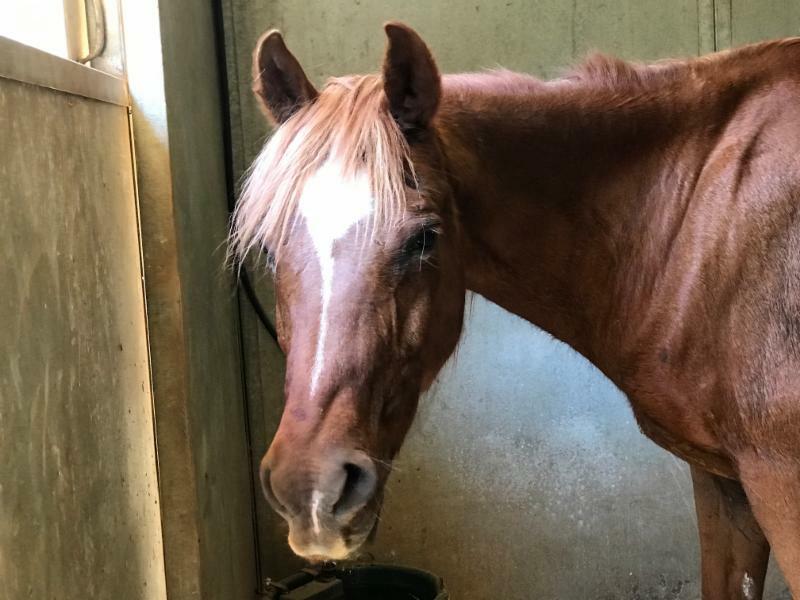 Clancey is swaybacked, but recent vet exam indicated she was in good health cleared for light riding. 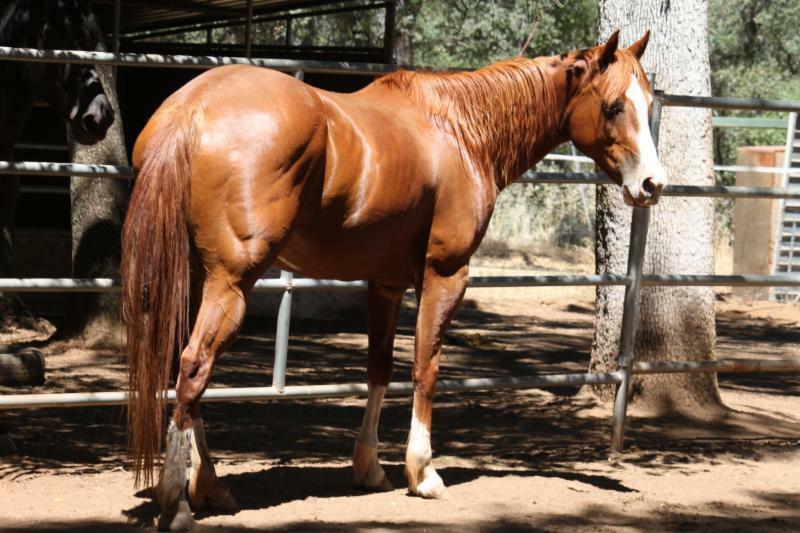 That being said, she’s an older mare and swaybacked, so a lighter rider is most appropriate. We were told she is great for kids. Her back teeth are worn to the gums, so she needs a diet of soaked pellets or soaked cubes. 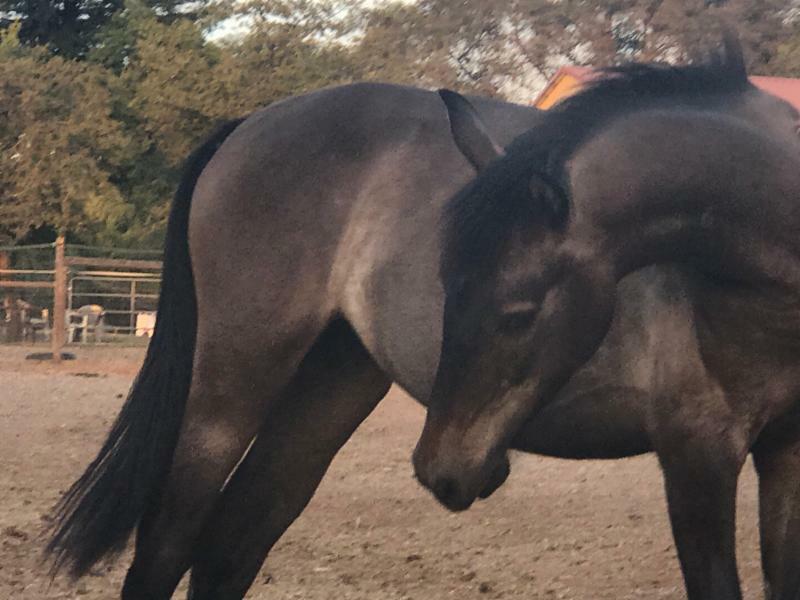 She is a very nice little horse — a bit spoiled and pushy right now, but responds well to signals and training. She is people oriented, lovable. 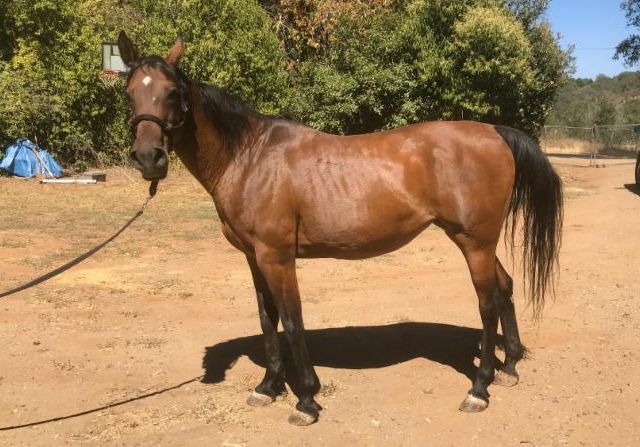 She’d be a super horse for a child or teenager. 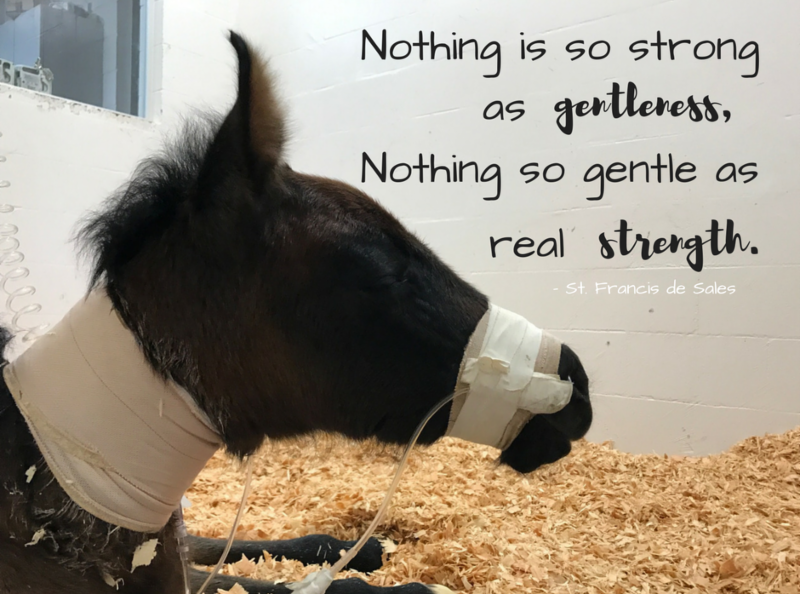 This is the time of year we are overwhelmed with requests for help with horses. If you’re interested in adopting or fostering, please contact AAE. 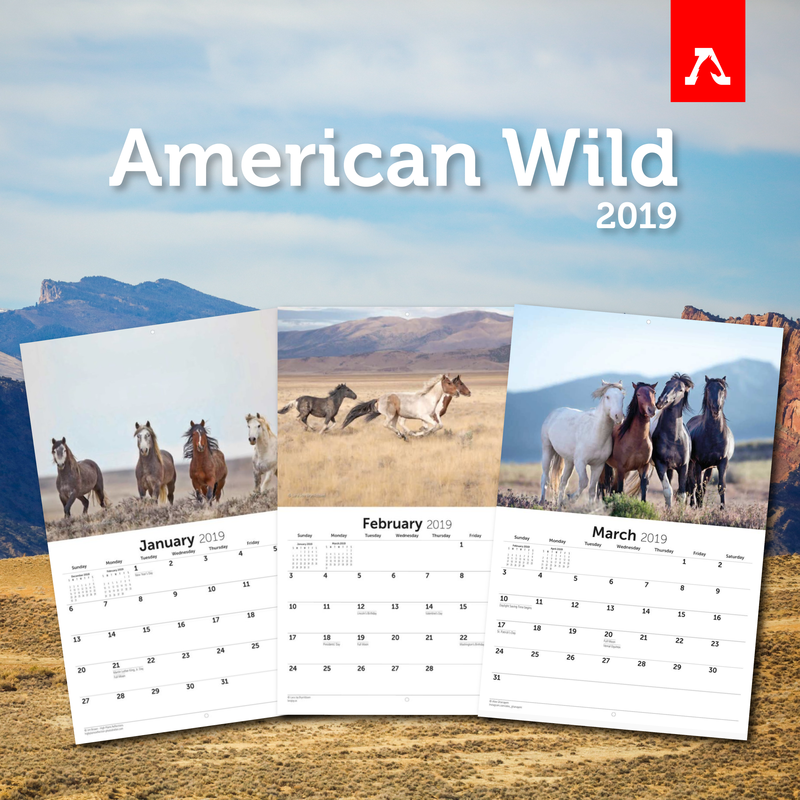 10 days until 2019, YOUR donation means more horses can be helped! Donate Today! 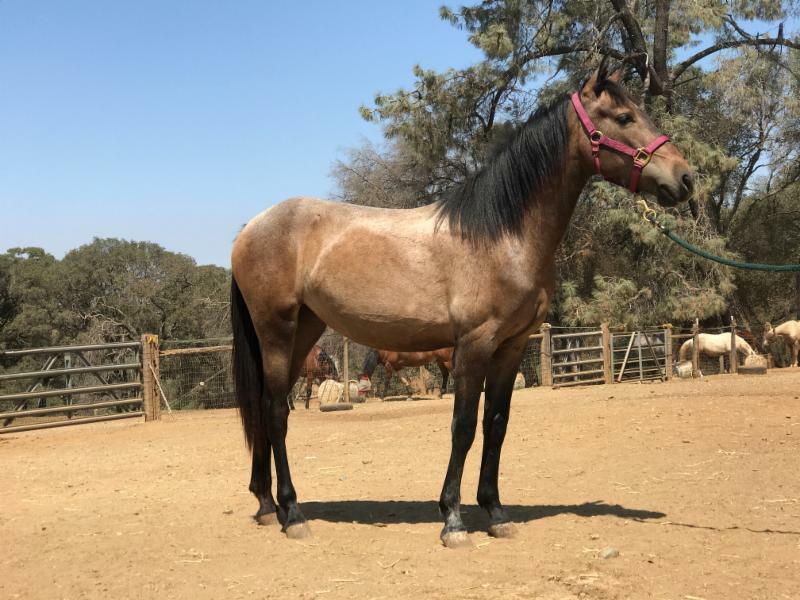 Shelby came to AAE in April 2017. 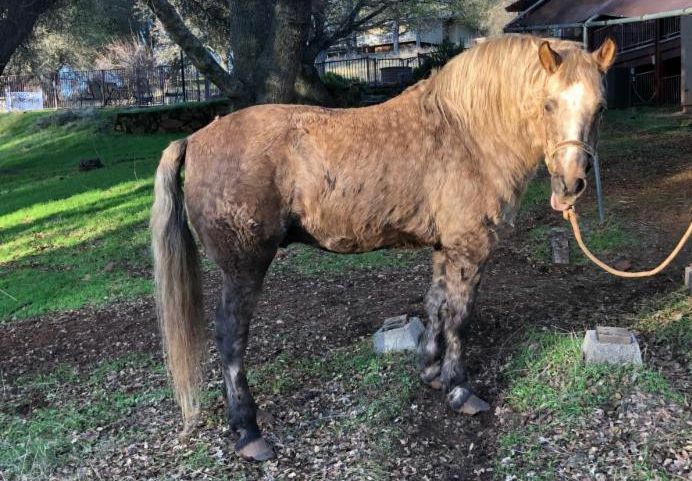 She had basically been abandoned, then given to a neighbor after they found her roaming the neighborhood with a rope around her neck and contacted her owner. 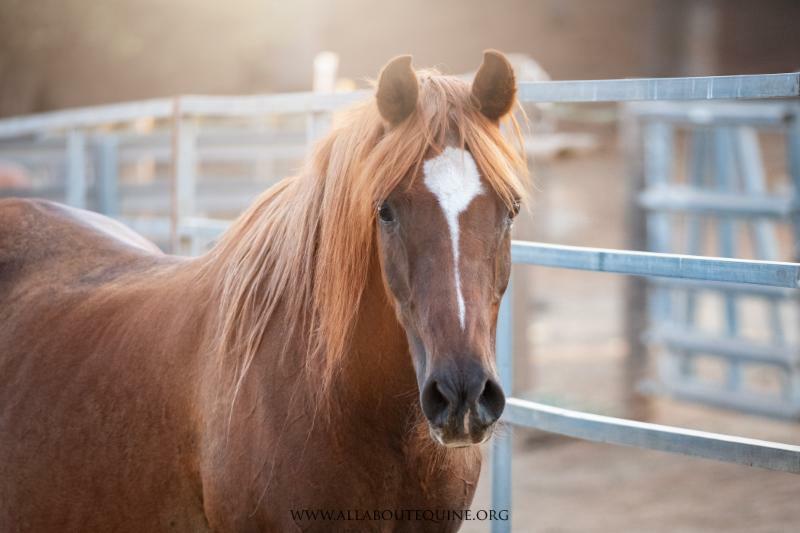 Her new owners contacted AAE after they realized they did not know enough about horses to provide proper care. Although they fed her, she was thin. 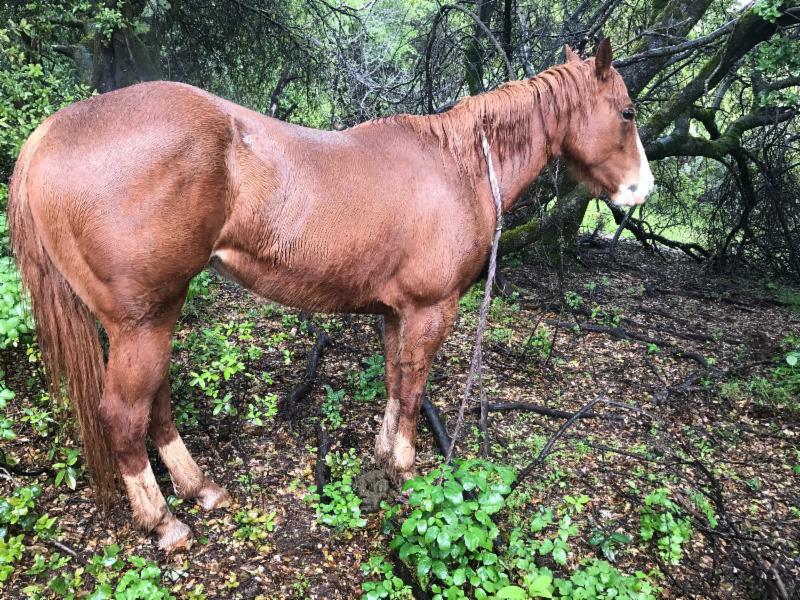 Her new owners were unable to catch her or even touch her, let alone remove the rope. 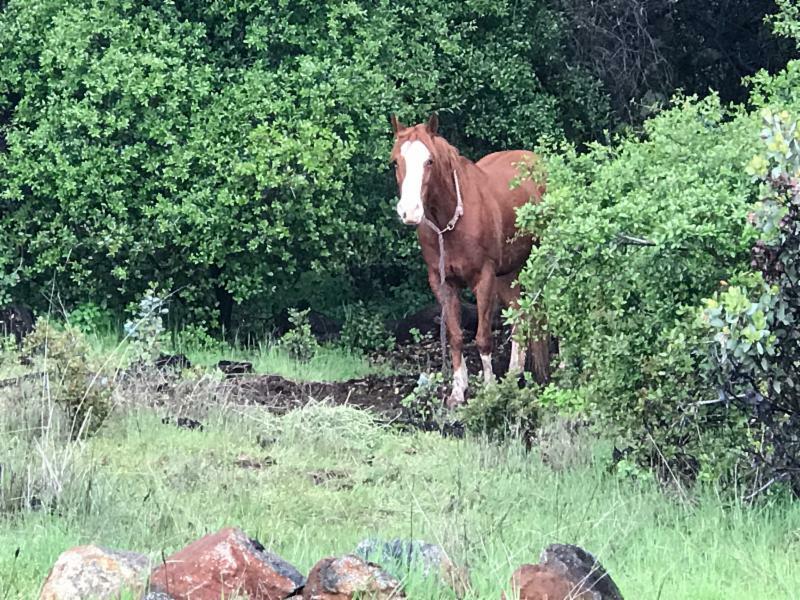 When we arrived to pick her up, she was on 80-acres of open land. 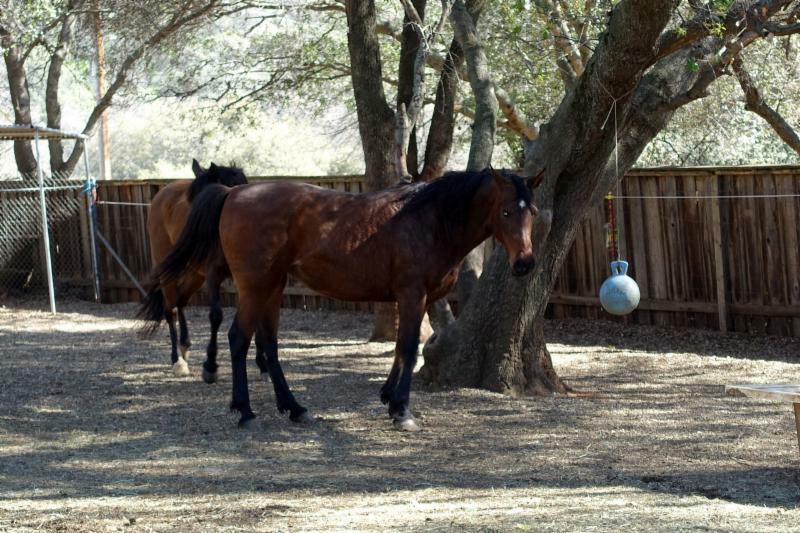 It took about two and one-half hours to earn her trust and place a halter on her, and finally remove the rope. She was fearful and reactive, and acted as if she’d been mishandled. She also seemed terrified to come out of the thickets. Of course, poison oak was everywhere. 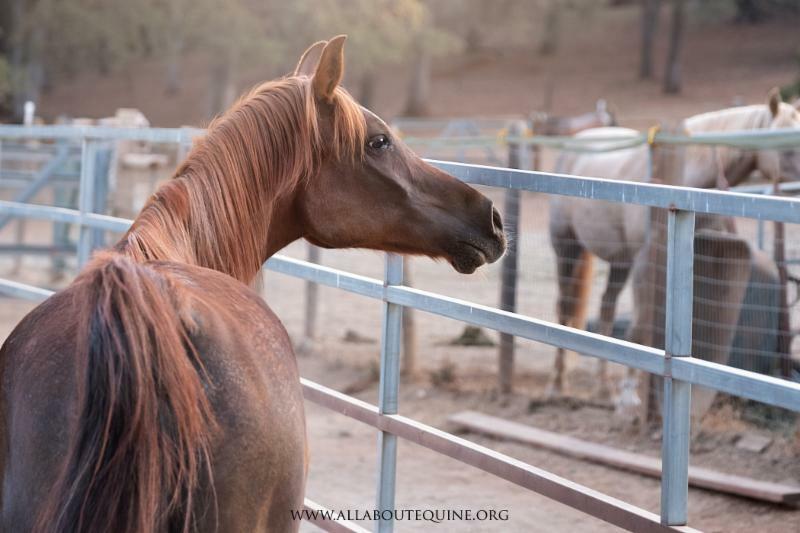 While at AAE, Shelby learned to trust and appreciate human interaction. 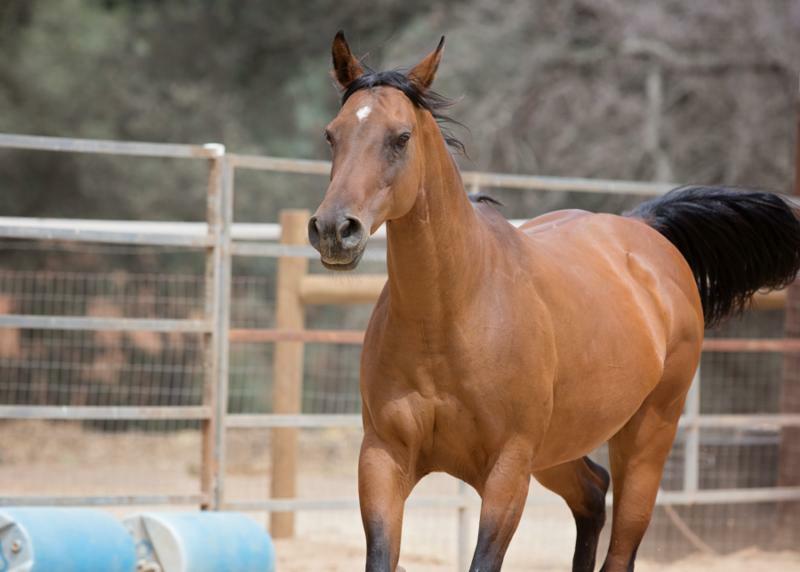 Underneath the fear was a very sweet, sensitive and social mare. Eventually, she sought attention and enjoyed grooming. However, if she felt too much pressure, she was defensive/protective. No previous handling/training history was available. Shelby spent her last months with AAE with a foster. 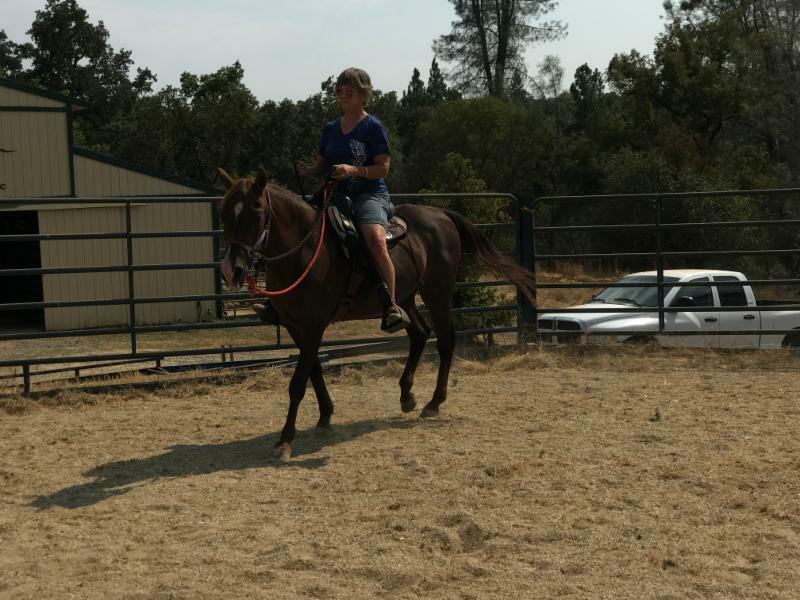 Throughout her stay with AAE, she gained a lot of confidence with new situations. She learned to look to her person for assurance, and she was willing to trust and follow her handler. Her moments of anxiety became fewer and further between. 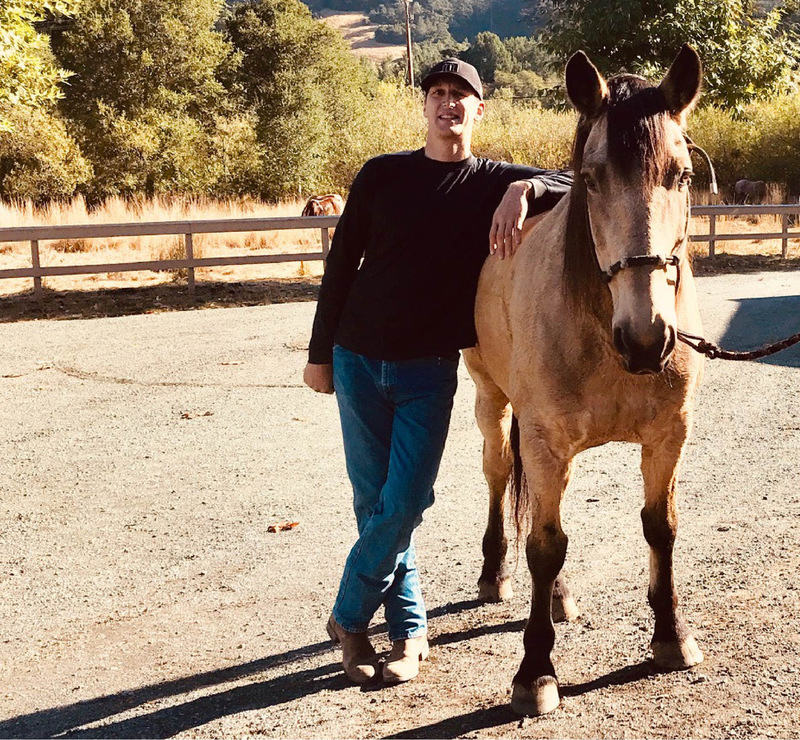 She was not a spooky horse, but had a busy mind, so the key was to get and keep her focus without her feeling too much pressure. She was always thinking and tried hard to understand what was being asked. A slow, calm approach to new things worked well, and not letting her escalate. Once she got over any initial anxiety, she was good to go. 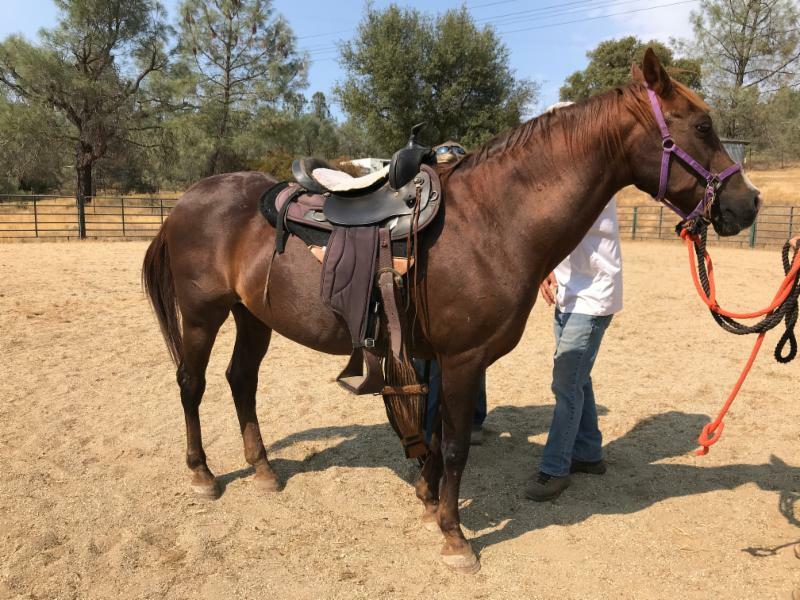 Shelby learned her groundwork quickly, and she was saddled successfully. She was working on consistent forward movement with a plan to graduate to ground driving when her person came along. 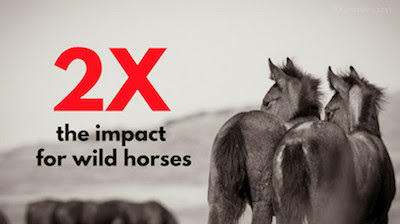 11 days until 2019, YOUR donation means more horses can be helped! Donate Today!